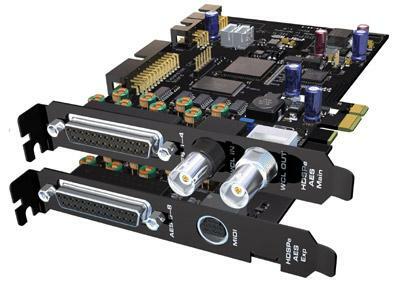 RME HDSPe AES : The HDSPe AES is a short-length PCI Express card with AES/EBU interfaces. It provides eight AES inputs (16 channels) and eight AES outputs (16 channels) at 192 kHz sample rate. The card is also equipped with two MIDI I/O ports, word clock I/O, and can be used with the optional TCO module for synchronization to LTC and video. The card's mainboard contains word clock I/O and a 25-pin D-sub connector, providing four AES inputs and four AES outputs via standard digital breakout cable (Tascam pinout). The word clock input is galvanically isolated via transformer and operates on Single, Double and Quad Speed signals automatically. The expansion board adds audio channels 9-16 and a connector for a MIDI breakout Cable with two MIDI I/Os (four 5-pin DIN connectors). It does not require a PCIe slot.